The world of high speed connectivity is constantly changing and evolving, which is why we made it easier for you to make smart decisions about which high-speed interconnect products you should use. 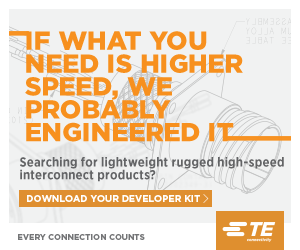 Everything you need to design your application is at your fingertips in TE Connectivity’s (TE) High-Speed Products Developer Kit. Our Developer Kit includes product drawings and brochures, 3D PDFs, product specifications and links to additional web content. Download your Developer Kit today.